This post is going to be my thoughts on some organic makeup. 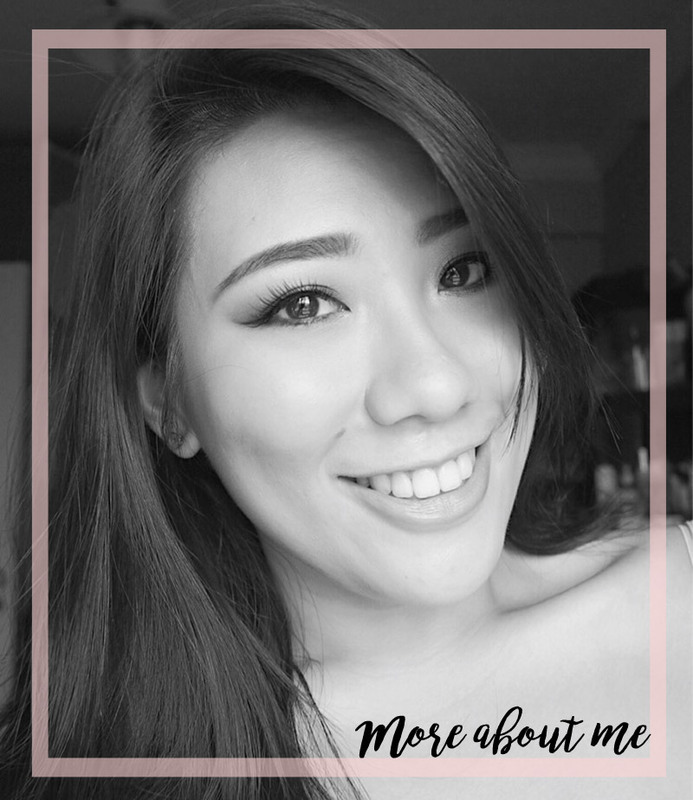 This was my first time dabbling with organic makeup from the brand, Reflections Organics, and am sharing my review after playing with the products for about 3 weeks. Firstly, since we are on the topic of organic makeup, I think it's best if we debunk some myths and assumptions of organic and natural makeup. Many of us tend to associate the term organic with a better or healthier alternative. That assumption can have some merit to it but it may not be true in many cases as well. Organic makeup products are basically products with cosmetic ingredients that comes from organic plants, without the use of synthetic chemicals or pesticides. It does not necessarily mean that it is kinder to the skin or providing lower chances of irritation. There is a common misconception that all synthetic ingredients are bad and all organic/natural ingredients are good. This isn't the case at all as there are good and bad in each category.There are also close to nil regulations on labelling and branding so even with just one organic ingredient, the product can be labelled organic. That being said, I am extremely tough when it comes to reviewing organic products. 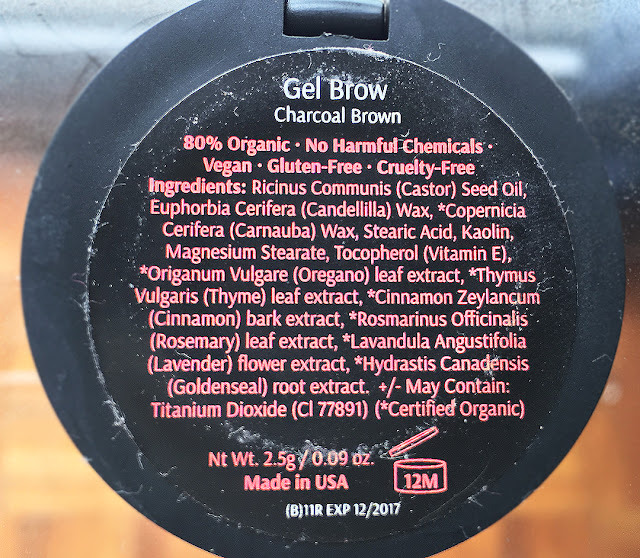 But recently, I got to try out the Gel Brow in Charcoal Brown and the Lip Butter in toffee from Reflections Organic, and they have passed my personal test. 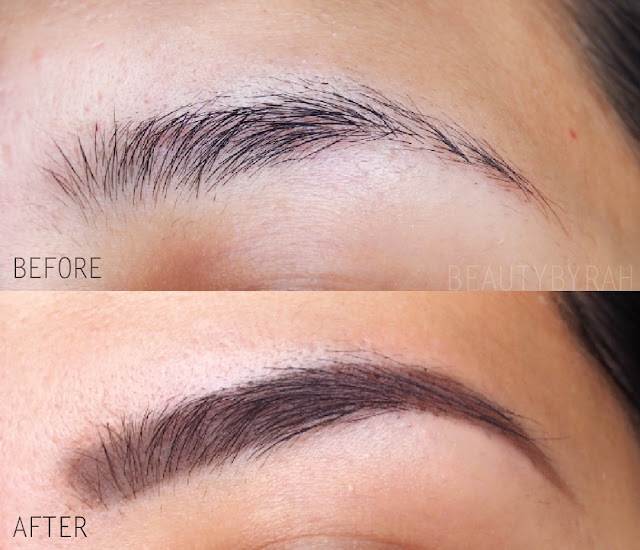 The Gel Brow is basically like a brow pomade, where one dips in an angled brush and apply the product onto the sparse areas that needed to be filled. 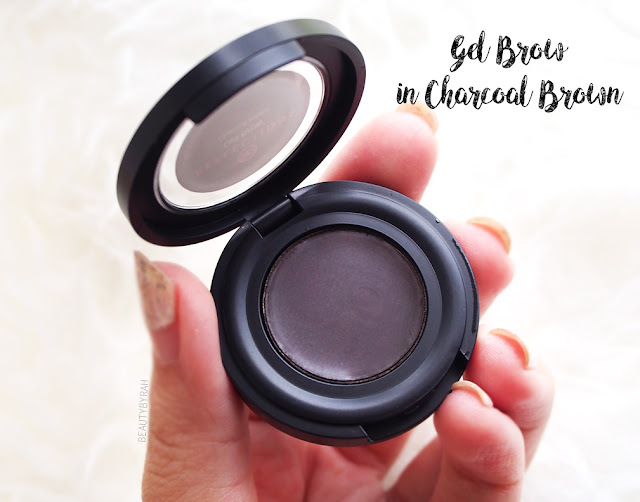 I tend to gravitate towards such products rather than a powder or pencil, as I like to use it to shape my brows as well, besides filling them in. Also from my experience with other brow products, gel or pomades tend to last longer on me. This product comes in a plastic, flip-open packaging (like a single eyeshadow). I do like this as it is much easier to open for me personally, as compared to a little pot with a screw on cap. However, this also means that the product is more prone to air exposure and can dry out faster. But looking at the ingredients list and seeing that castor seed oil is the first ingredient, the chances of it drying out really quickly are low. Why this difference? I have no idea and this should not be the case at all. Despite the irregularities of the ingredient list, the formulation of this product is actually pretty nice. 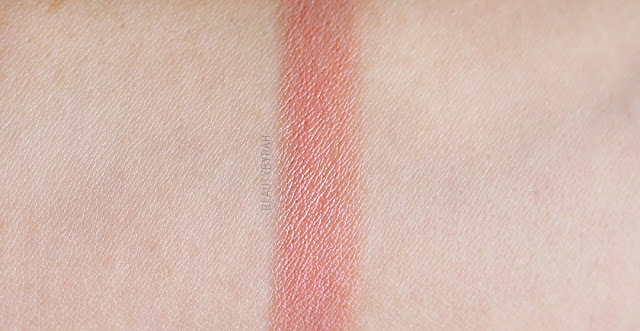 It is creamy and glides on nicely onto the skin. It blends pretty easily using a spoolie, but I realised that it sets quite fast, so I have to work fast. The shade is a rich, warm-toned brown and it goes nicely with my skin tone and matches my brow hairs. Do note that this is the only shade available for the gel brow. After realising that the product contains castor seed oil as the first ingredient, I did not expect the product to last long on my oily skin coupled with the constant perspiration due to Singapore's hot and humid weather. I was pleasantly wrong - this lasted the whole day on me and it did not turn splotchy or patchy on the brow area (which some brow pomades can do). Moving onto the lip butter, I got mine in the shade Toffee Butter, which is really pretty pinkish neutral shade. Note: As there are no chemical preservatives in our lip butters, they may bruise during transportation. This lip butter glides on really smoothly onto the lips, with no tugging at all. I am thoroughly enjoying its creamy formulation. This shade also works great as a touch up to blend the remaining lipstick on the lips. What I mean by this is when I wear darker tones on the lips and when it wears out, it tends to disappear near the middle of my lips and I would be left with an outline around my lips. Adding this lip butter on top helps to moisture my lips, while at the same time blending and mixing with the older lipstick crust, resulting in a nudish ombre lip. Hope you get what I mean. 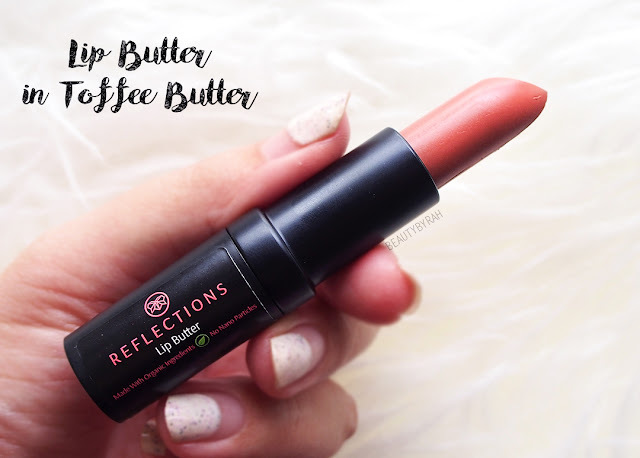 Despite its creamy texture, I do find that the lip butter does stay on my lips for a good period of time. It does not set so it does transfer when you drink or eat, but touching up is easy and usually I do so without using a mirror. The product is soft and is easily bruised, something mentioned on the site as there are no chemical preservatives present. After one use, the lipstick broke a little, resulting in it leaning onto the sides of tube and causing minor bruising. I highly recommend to treat this with care and keep majority of the bullet in the tube while applying it onto the lips. Overall, I am enjoying these two products. However, for the price, I do think it is slightly pricey if I compare it to my other mainstream alternatives. They work just as great. 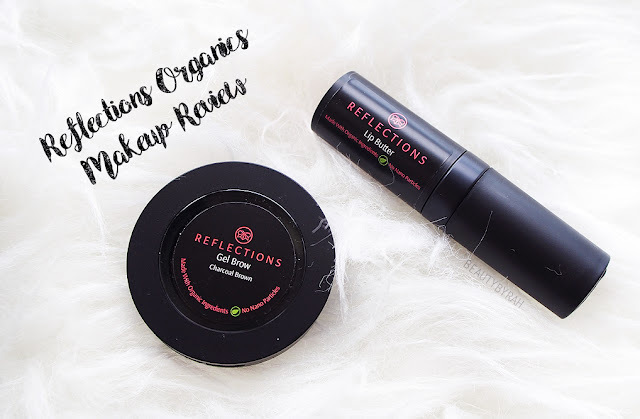 Personally I am not one who gravitates specifically to natural or organic products, but if you do, Reflections Organics can be a brand to check out. For more information on this brand, you can check out their website. Hope this post was useful in some way!